I thought Linn Ullmann and I were going to sit down and record a little conversation about her new novel, The Cold Song (Other Press) , but we found out that we had a lot more to talk about. So much, in fact, that we ran over the time set up by her publisher and had to get together for a second session during her stay in New York for PEN America week! In part 1 of our first 2-part episode, Linn talks about the influences of her parents — Liv Ullmann and Ingmar Bergman — on her storytelling process, her subversion of the “Scandinavian crime novel” in The Cold Song, the importance of place in her writing, the perils of overthinking the ground rules for an interview (not ours! ), how she transposed a character from The Wire from Baltimore to Norway, and how she managed to convince her book club to tackle Proust. We close out with the topic of Karl Ove Knausgard’s work and the ethics of explicitly writing fiction from life (which is where part 2 picks up). Ms. Ullmann’s a fascinating writer and this is (this first half of) an illuminating conversation about her work and life. Give it a listen! 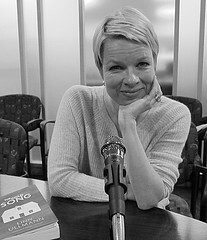 Linn Ullmann is a literary critic and the author of five novels: Before You Sleep (1998), Stella Descending (2001), Grace (2002), A Blessed Child (2005), and The Cold Song (2011). Grace won The Reader’s Prize in Norway and was named one of the top ten novels that year by the Weekendavisen newspaper in Denmark. In 2007, Grace was longlisted for the Independent Foreign Fiction Prize in the UK. A Blessed Child was shortlisted for the Brage Prize in Norway. In 2007, Ms. Ullmann was awarded the Amalie Skram Award for her literary work, and she received Gullpennen (the Golden Pen) for her journalism in Norway’s leading morning newspaper Aftenposten. In 2008, A Blessed Child was named Best Translated novel in the British newspaper The Independent, and in 2009 the novel was longlisted for the Independent Foreign Fiction Prize and the International IMPAC Dublin Literary Award in the UK. Linn Ullmann’s novels are published throughout Europe and the U.S. and are translated into 30 languages. The Cold Song was recently published in the U.S. by Other Press. Ms. Ullmann lives in Oslo with her husband Niels Fredrik Dahl, a novelist, playwright and poet. She has two children, Hanna and Halfdan, and two stepchildren, Dagny and Kasper. She also has a dog named Charlie. Credits: This episode’s music is Sweetheart Like You by Bob Dylan. The conversation was recorded at the Other Press offices on a pair of Blue enCORE 200 microphones , feeding into a Zoom H4n recorder . The intro and outro were recorded on Blue Yeti USB Microphone . Processing was done in Audacity and Garage Band. Photo of Ms. Ullmann by me.